Truthfully, I probably would not go out of my way to seek out kohlrabi, a German turnip, that looks like a martians’ head with antenna leaves. Although this funny looking root vegetable is eaten raw as an hor douvres, especially within the Persian community it just never appealed to me. The taste and texture of kohlrabi is similar to a broccoli stem or cabbage heart, but milder and sweeter, with a higher ratio of flesh to skin. So knowing that, why would I venture to eat something that tastes like a broccoli stem. When was the last time you ate a raw broccoli stem? Since I found this recipe online… not sure which site, I decided to try it. 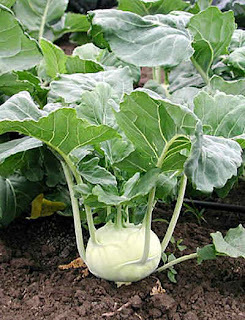 So why all this huff and puff about kohlrabi…. because my CSA delivered 3 giant ones this past week and I try everything they give me. After trying this simple recipe, I have to say that I have a change of heart with kohlrabi. Honestly…it really goes to show that almost anything roasted with a dash of olive oil turns out great and this was no exception. SO I encourage you to try this recipe. The olive oil and garlic enhance the flavor of the kohlrabi which tastes like a cross between a roasted potato and artichoke heart. Roasting gives the outer layer a slight crunch on the outside and oh so smooth on the inside. 1. Preheat an oven to Roast at 450 degrees F.
2. Cut the kohlrabi into 1/4 cubes. Combine olive oil, garlic, salt and pepper in a large bowl. Toss kohlrabi slices in the olive oil mixture to coat. Spread kohlrabi in a single layer on a baking sheet. 3. Roast in the preheated oven until browned, 15 to 20 minutes, stirring occasionally in order to brown evenly. Remove from oven and serve immediately. I certainly would prefer to have kohlrabi roasted as you’ve done through this simple, yet tasty recipe…however, I’ve quite grown to like it raw too. I cut them up in sticks and snack on them as I’m preparing a meal. This keeps me from munching on the wrong foods ;o) Maybe the time you ate it raw…it may not have been at it’s best?!? I think you could be right about that. I know that many people eat it in salads raw similar to the way fennel is eaten in a salad.